Did I already tell you that I my favourite place to buy band tees on Etsy had a Black Friday and Cyber Monday sale? I picked up this t-shirt that’s been in my Etsy basket for months. I’m really excited for it to arrive. I asked Tom months ago for hints of things he may want for Christmas and he couldn’t come up with anything. But lo and behold he sends me some ideas two days ago after I have finished shopping for him. Go figure. 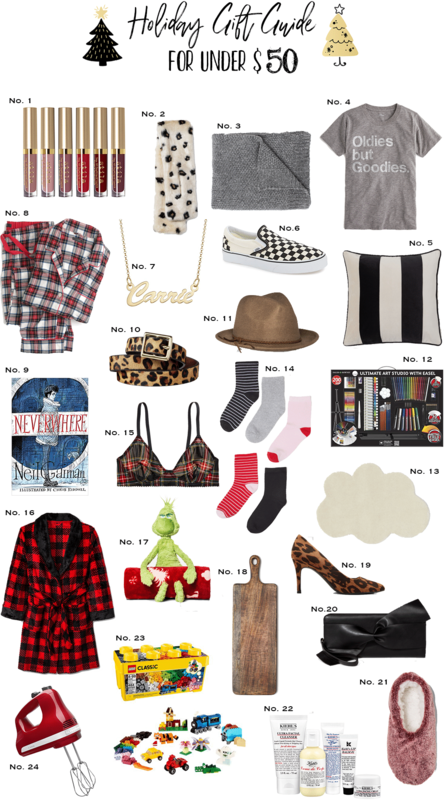 The gift guide above is everything for under $50 but truthfully, almost all of them are under $30. Iconic Roald Dahl Stories Are Coming to Netflix as an Animated Series. What it’s Like Being an INTJ Woman. <——- Me. The Biggest Fiction Bestsellers of the Last 100 Years. What the Popularity of Fortnite Has in Common With the 20th Century Pinball Craze. 9 Tricks Advertisers Use to Make Food Look Delicious. Which is why I am always disappointed when I get my burger. The Testaments: Margaret Atwood’s Sequel to A Handmaid’s Tale Will Arrive in 2019. A Two-Week Workout Plan That Just Takes 10 Minutes a Day. This will be good for those of us that have trouble squeezing in exercise over the holidays. 7 Hidden Ways We All Waste Money Over the Holidays. How to Have the Ultimate Harry Potter Day at Universal. Re: cookie recipes, an easy one I’ve done a few times is my late great-great aunt’s snickerdoodle recipe. Admittedly, it does start out with a basic sugar cookie recipe, but doesn’t take like boring old sugar cookies when finished. Once the dough is made, roll it up into little balls like you’re playing with Play Doh then set them aside. Get a bowl and mix a couple of spoonfuls of sugar with an equal amount of cinnamon (more or less of the mixture depending on how much you like cinnamon). Roll the dough balls in the mixture so they’re coated. spread on a cookie sheet, then push a piece of chocolate onto each cookie ball, slightly (but not completely) flattening it. My aunt always used Hershey’s Kisses, I’ve used Cadbury’s Buttons, but any kind of chocolate will do. That’s pretty much it though, once you’ve topped with the chocolate of your choice you just bake as usual. I do 180C, because one-eighty is great-y. Probably 10 to 15 minutes, but I don’t really pay attention to the clock, just keep an eye on it and a toothpick handy to make sure the dough gets cooked through. These sound awesome Traci. I actually really like Snickerdoodle bars so these would be winners. I’m such a non baker 😂 thanks for the detailed info. I’m going to head out this week to get ingredients for everything. I’ll let you know how well I did.